Air101: WoW heating up Iceland's price war. WoW heating up Iceland's price war. 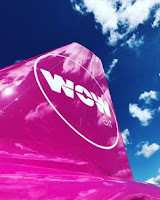 Iceland's popular low-cost airline WOW air is stepping up its price war with Icelandair with the introduction of special $99 one way fares from a number of US cities to its Keflavík International Airport hub. The low price deal is available from Boston, Chicago, Cleveland, Dallas, New York, Pittsburg and San Francisco. Travel is valid in August, September and October. "We are excited to invite visitors from the United States to experience all that Iceland has to offer in the fall," said Skúli Mogensen, founder and CEO of WOW air. "We continue to see demand for our affordable transatlantic offerings and we hope that Americans can take advantage of these low prices and enjoy Iceland in the coming months." However, you'll have to be fast if you want to take advantage of that fare, for it only applies to 800 seats, on select flights, for travel between 6th August and 26th October and is subject to availability. Icelandair recently cited the increased capacity across the Atlantic and the reduced peak-season fare trend as reasons for a predicted reduction in its EBITDA for 2018.